Halloween is my mom’s favorite holiday. She decks out the house, inside and out, with decorations that she has collected over the years. Although I haven’t been home for trick or treating in years, I can perfectly imagine her excitement as she waits for the neighborhood children to ring the doorbell. When I went away to college, she started sending me Halloween care packages. Almost 20 years later, these packages still arrive like clockwork. She goes all out, decorating the outside with spooky stickers and filling it with yummy treats. Now that I’m married, I have to share with Evan, but I don’t mind. Mom does it up right, with treats for us both. Learning that we were planning a Halloween camping trip with friends, my mom tailored this year’s gift package to the excursion. She’s basically a pro. There were two bags of candy, a kitten and skull face masks, and a tube of glow sticks all stuffed into a canvas jack-o-lantern bag. Obviously, the glow sticks were a huge hit, and we broke out the masks as the bag of candy made its way around the fire. It was the coldest weekend yet this fall, but we were well prepared with our winter coats and heavy blankets. It was a memorable camping trip, and a memorable Halloween weekend. Thanks, Mom. You’re the best! The candy bag somehow managed to survive the weekend, and was still half full when we arrived home. What to do, what to do?!? Browsing Facebook, I came across a post for 50 recipes to use up your leftover Halloween candy. Excellent! Included in this year’s care package was a bag of fun-sized Butterfinger candy bars. 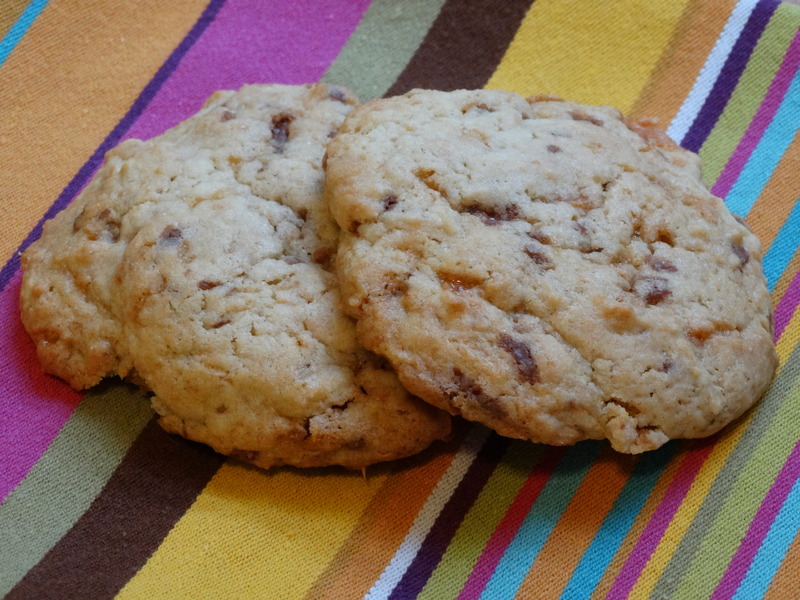 Butterfinger is my favorite, so when I came across a recipe for Butterfinger cookies, I couldn’t pass it up. 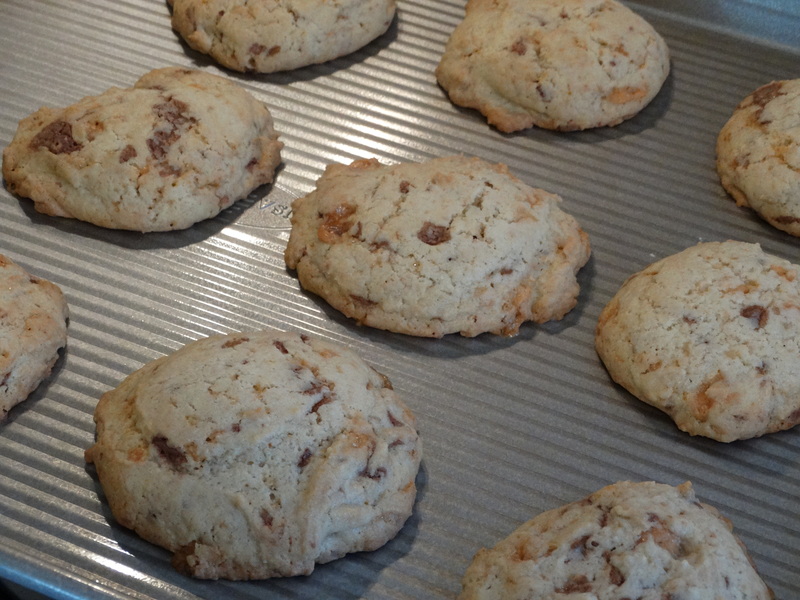 You will need 1-3/4 cups all-purpose flour, 3/4 teaspoon baking soda, 1/4 teaspoon salt, 3/4 cups granulated sugar, 1/2 cup salted butter, 2 large eggs, and 8 fun-sized Butterfingers. Add the flour, baking soda, and salt to a medium mixing bowl. Use a whisk to combine. Add the sugar and 1/2 cup, or 1 stick, of softened salted butter to a large mixing bowl. 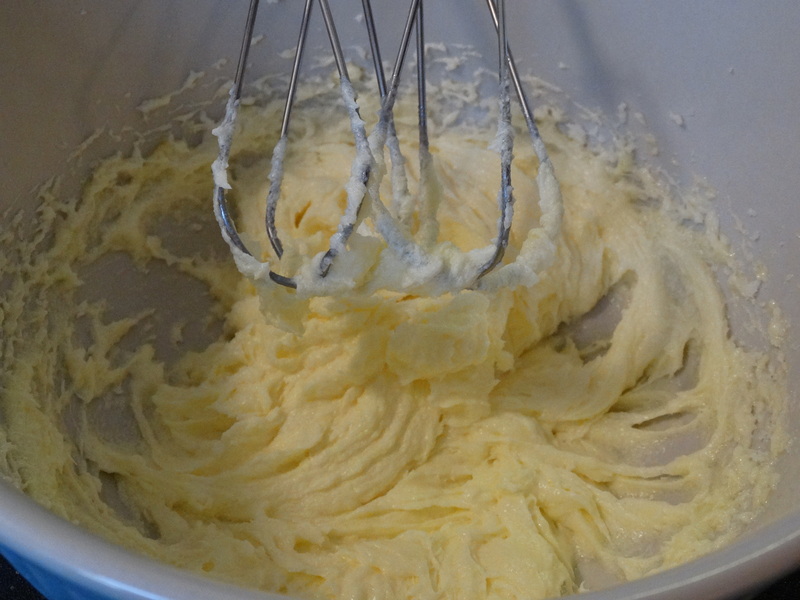 Use a mixer to beat together until nice and creamy, then beat in 2 eggs until well mixed. Sugar and butter, mixed together. 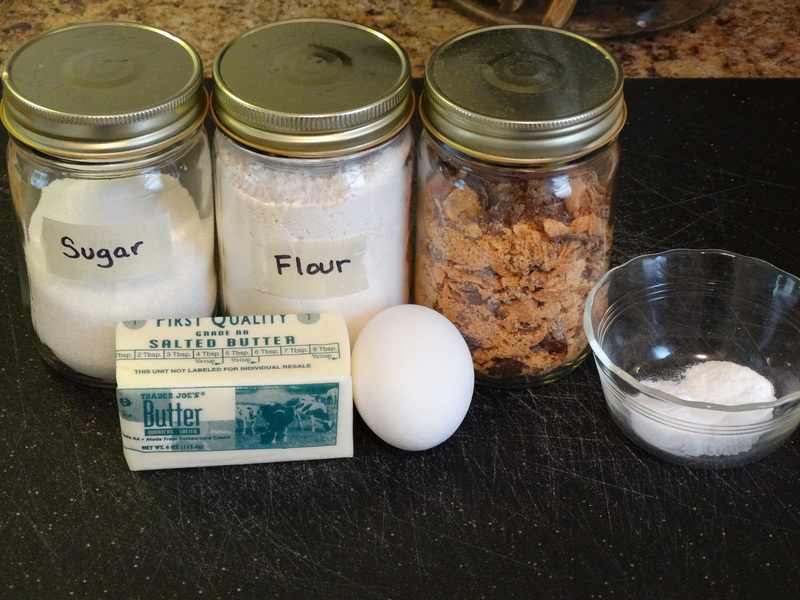 Sugar, butter, plus 2 eggs mixed together. Gradually beat the flour mixture into the sugar mixture. I did mine in three increments. The batter will be pretty thick. Chop your Butterfinger bars. I had some finely chopped pieces, but also kept a handful of larger chunks. 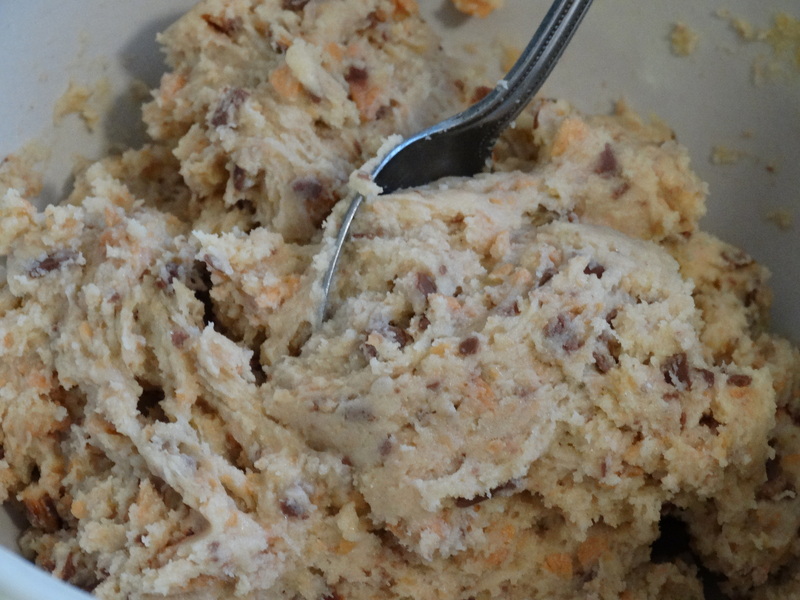 Stir the Butterfinger into your batter by hand. 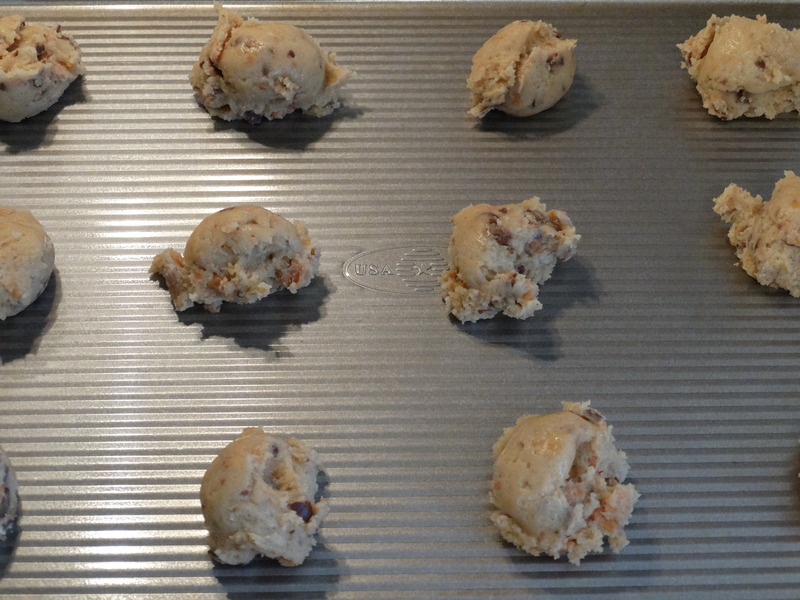 Drop heaping tablespoons of batter onto an ungreased baking sheet. Bake for 10-12 minutes, or until slightly browned. Transfer the cookies to a wire rack to cool completely before serving. Enjoy! These disappeared faster than they took to prepare! 1) Preheat your oven to 375 degrees. Add the flour, baking soda, and salt to a medium mixing bowl. Use a whisk to combine. 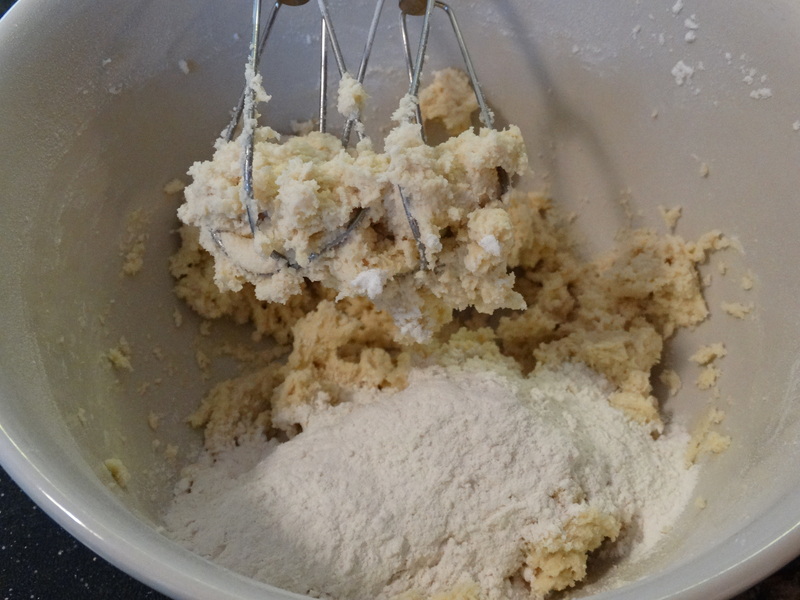 2) Add the sugar and 1/2 cup, or 1 stick, of softened salted butter to a large mixing bowl. 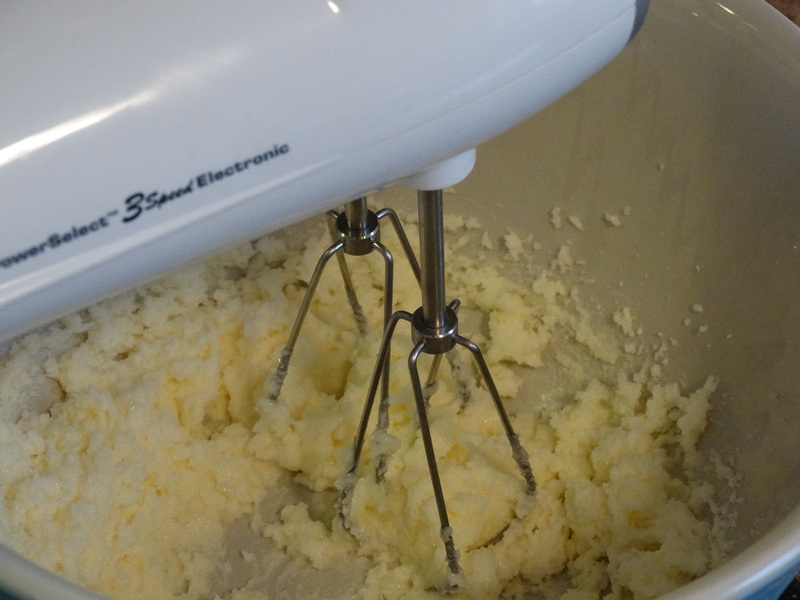 Use a mixer to beat together until nice and creamy, then beat in 2 eggs until well mixed. 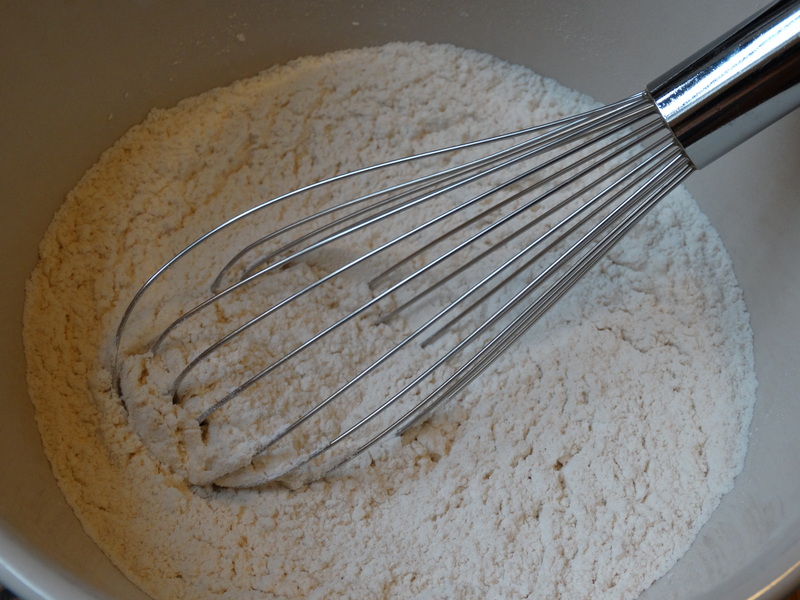 3) Gradually beat the flour mixture into the sugar mixture. The batter will be thick. Drop heaping tablespoons of batter onto an ungreased baking sheet. Bake for 10-12 minutes, or until slightly browned. 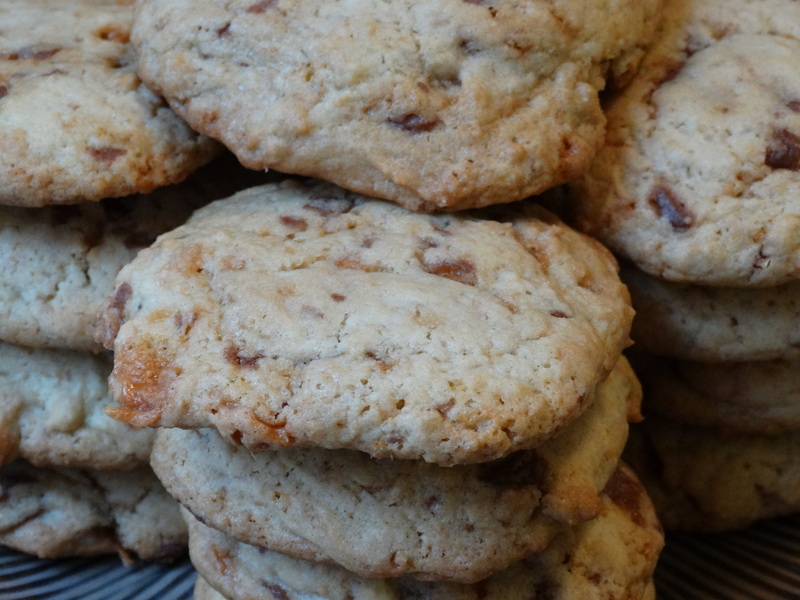 4) Transfer the cookies to a wire rack to cool completely before serving and enjoy! These look delicious! I can’t wait to bake some for our Thanksgiving potluck! Thanks for sharing!! !